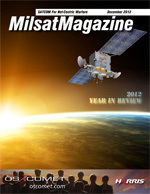 Participants at the recent SMI Global Milsatcom Conference in London heard loud and clear how the fiscal cliff of the U.S. Government can overshadow huge bandwidth demand from UAVs, growth of on-the-move capabilities, and the continued bandwidth crunch in the historically secured and stable military satellite communications (MILSATCOM) market. Chief Master Sergeant Carol A. Dockery is the Command Chief Master Sergeant, Space and Missile Systems Center, Los Angeles AFB, California. Chief Dockery supports the SMC Commander in assessing military readiness, pushing process improvements and workforce development. Her efforts support over 6,000 personnel and their families assigned to three stateside locations. As technology advances, adversaries have increasingly sophisticated capabilities to jam transmissions over geosynchronous satellites. There are multiple deployment scenarios to consider when it comes to implementing anti-jam technology. The question then becomes, what constitutes the best way to deploy anti-jam technology for SATCOM? The Air Forces satellite enterprisefor many decades the developer and operator of the worlds most advanced military spacecraftis under pressure to downshift. Decision makers at all levels rely on the availability of effective and efficient communications when faced with emergency or crisis situations. Military combat, terrorist activities, and natural disasters are examples of crisis situations in which availability and performance of communications systems are critical to mission success and, ultimately, preservation of human lives. Decision makers ability to make informed, life-saving decisions depends heavily upon the capability to transmit and receive data when and where needed. From first responders to Non-Government Organizations (NGOs) to military assistance, all rely upon emergency communications to save lives and protect property. Hosted Payloads + Capitol Hill: The Good, The Bad + The Ugly, The FY13 Presidents budget created several different funding lines in support of hosted payloads. Early in November of 2012, a spokesman for North Koreas National Defense Commission stated that its strategic rocket forces are within the scope of strike of the U.S. mainland. The announcement followed a new U.S.-South Korea missile agreement. PIONEERING: Sustaining U.S. Leadership In Space , The Space Foundation believes that NASA needs to embrace a singular, unambiguous purpose that leverages its core strengths and provides a clear direction. On December 4th, the Space Foundation released PIONEERING: Sustaining U.S. Leadership in Space, which puts forth recommendations to strengthen both NASA�s focus, oversight and funding and the overall U.S. civil space program.